This is part of a 5 week summer feature at One Arts Infusion Collaborative! Each week, a brand new summer-themed poem will provide the background to complete the 4 included worksheets. This week's poem is entitled, The 4th of July Family and Friends Parade. Sheet 1 contains the poem and a space to illustrate it. Sheet 3 contains 6 drawing boxes for patriotic pictures. Sheet 4 contains a simple format for creating your own poem. Just a little fun, creative learning to mix it up in the summer, fill a rainy afternoon, or simply keep active minds active. Stay tuned for next week's new summer-themed poem pages!!! 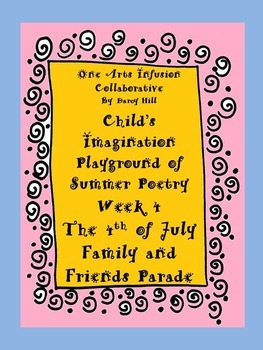 Child's Imagination Playground of Summer Poetry Week 4: The 4th of July Parade by Darcy Hill is licensed under a Creative Commons Attribution-NonCommercial-NoDerivatives 4.0 International License.